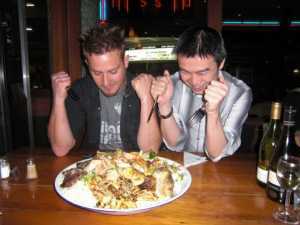 "Do not dismiss the dish saying that it is just, simply food. The blessed thing is an entire civilization in itself"
One of our most popular dishes for couples and small groups is the (drum roll...) Bosses' Special House Platter (see picture on right) -- a sumptuous combination of marinated slow-cooked lamb shank, pirzolah kebab, grilled chicken breast, calamari, smoked chicken, king prawns, with fresh leaf and choban salad, served with rice, yoghurt and chilli sauce, garnished with pita bread. Make sure you arrive with a good appetite! We cater for vegetarians, with lots of yummy choices on our entree and main menus. All vegetarian dishes are marked on the menu with (V). We also have wheat-free meal options - please ask your waiter for information. It's been said that three major kinds of cuisine exist in the world: Chinese, French -- and Turkish! Turkey is a unique republic located on the eastern end of the Mediterranean. At the crossroads of the Far East and the Mediterranean, the cuisine of Turkey blends spices and culinary traditions from more than 30 cultures across the Middle East, Europe, Africa, Asia and Greece. Dating back to the 6th century, Turkish cuisine mirrors a long and complex history of Turkish migration from the steppes of Central Asia, where they mingled with the Chinese, to Europe, where they exerted influence all the way to Vienna. Good eating was so important to the Turks that the Ottoman courts even passed laws to regulate the freshness of food! Kebab is typically Turkish, although it is a Persian word for meat. It dates back to the times when nomads learned to grill and roast meat over their camp fires, and you will see the word used to describe numerous types of meat dishes, categorized by the way the meat is cooked. By the way, donner (or döner) means "rotating" in Turkish, and refers to the vertical rotating spit that is used to cook that type of meat. Our chefs make the donner kebabs in the kitchen from scratch with fresh chicken and lamb, and you'll often see the meat cooking on the rotating spit at the front of the kitchen. On our menu you will find a range of kebab dishes, including donner kebab (meat from the spit wrapped in a large pita bread), shawarma kebab (served with rice) Anatolia kebab (served on diced pita bread), shish kebab (cubed meat grilled on a skewer), and pirzolah kebab (lamb cutlets). Yogurt - Yogurt is not only a Turkish word, but is one of the country's most famous contributions to world cuisine! Yogurt made its way north to Bulgaria and Eastern Europe during the Ottoman occupation. Our kitchen team make all our yogurt themselves - and it's yummy! Moussaka - The word originates from Arabic, and this dish is cooked in slightly different forms all around the Middle East, Central Asia and Eastern Europe, and using different meats. In Turkey, Turabi Efendi published the first recipe of mussaka (Turkish Cookery Book) in 1862. The Turkish dish is made with eggplants, or other vegetables, cut into small cubes and cooked with minced (ground) meat. Only the Greeks include bechamel sauce! And to make it a lighter dish, we use chicken in our version. Mezze - Similar to the Spanish tapas, "mezze" are dishes that are eaten to start the meal off, comprising different items to nibble like olives, feta cheese, salami, dolmades. These are usually accompanied by wine or with "raki" (see below). Baklava - The recipe is believed to have originated many centuries ago in the kitchens of the Ottoman Sultans in Istanbul. In Turkey this delicious sweet of filo pastry and nuts with honey is usually eaten with coffee or as a snack. But don't let this stop you enjoying baklava as a dessert after your meal. But be careful - it's addictive! 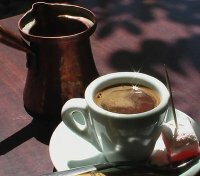 Turkish Coffee - This famous coffee comes thick and dark in a small cup and is usually served with lots of sugar. Raki - Turkey's national drink is made with aniseed, a little like Greek ouzo or French pastis. It has a real kick to it and is called the "lion's drink" or "lion's milk" because it is said you must be as strong as a lion to drink it!